My twins, Jack and Luke were born at 27 weeks and spent 10 weeks in the NICU. Both had a relatively straightforward time whilst there, but were monitored closely at the Liverpool Women’s Hospital were they were born. After discharge home, I was concerned about Jack not meeting his milestones so we were referred to the community therapy team. At the age of 2 years, both boys were given an MRI scan and diagnosed with PVL and CP. Both boys have diplegia. Jack and Luke are now 3 and a half years old. It hasn’t been an easy journey so far and I have had to push to get every therapy that we have I place. In fact, our neurologist who diagnosed the boys told me not to bother with any therapies as nothing works and the best I could do for the boys was just to take them home and love them! Being the person I am, I went completely against what he said and both boys have weekly physio, weekly hydrotherapy, weekly rides on the therapy trikes, play football once a week and they also have just started learning to do the plank to strengthen their core. They also have standing frames that they use every day for a minimum of an hour. Luke started on Baclofen around 5 months ago to see if would help relax his calf muscles and tone. I noticed straightaway that he was able to get his heels down (he normally walks right up on his tip toes) if you asked him too but it wasn’t something he was doing regularly. I am on a private group on Facebook for families with children with CP and another parent mentioned Karen Pape’s book- The Boy Who Could Run But Not Walk. I ordered it and was truly inspired from reading it. So much of this book I could relate to and I had already started questioning what could be done to get Luke’s feet down flat. I spoke to our physio about it – now Luke could get his heals down, what can be done to make it happen. We were referred to orthotics. In the meantime whilst reading Karen’s book, I completely could agree that Luke’s tip toe walking had become mostly a bad habit as we could see the heels could go down when he concentrated, but what could we do to break this habit of tiptoe walking? A few days later, I attended a kid’s party with my older boy (6) and was speaking to one of the school mums about Karen’s book and how we could break the habit of tiptoe walking. The school mum suggested squeaky shoes. She had no idea if you could buy squeaky shoes but thought something like that could incentivize Luke to get his heals down. As soon as I got home I Googled squeaky shoes and found some on sale on eBay. Well, Luke loves his squeaky shoes and now walks 70 per cent of the time with his heels down when he is wearing them! Everywhere we go people are amazed at the difference in his walking but the most amazed are the medical professionals. None of them had heard of squeaky shoes. I explain the whole reason of getting them – brain plasticity, changing habits and Karen’s book. They too can’t believe the difference in Luke’s walking. We are waiting to hear now if Luke will need Botox. He had a gait analysis done- bare foot then with his squeaky shoes. Once our consultant has reviewed the video footage he will decide whether to go ahead with Botox or just continue with “shoe therapy” as he called it. 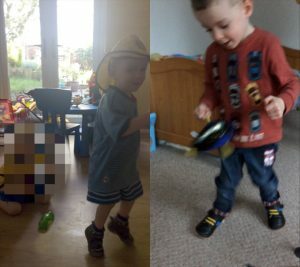 We are still waiting to hear if Luke will have SDR surgery in the future but thanks to Karen’s book, the squeaky shoes are doing the trick! I am so grateful to hear of stories about the innovative ways parents discover how to change early-formed maladaptive habits. I look forward to your comments and hope for more stories to share! Great story, I have something similar for my daughter lined up, when she fits them on Amazon I brought trainers with pressure sensors in the heels, which trigger led lights, so if she’s placing her heel properly the lights will flash! Would you please post a link to the heel pressure light up shoes?